Footballer Aaron Ramsey left some Twitter users nonplussed after posting an online message in Welsh. The Arsenal FC midfielder, 24, uploaded a picture from his 2014 wedding with the caption "un flwyddyn heddiw", which means "one year [ago] today". In contrast to positive responses, some users expressed confusion while others ridiculed the message. One questioned whether the FA Cup winner was "drunk" and another asked if he had "had a seizure". The tweet, posted on 8 June, attracted criticism for its lack of an English translation. Twitter user @RightJudgeIam posted: "Did you lean on the keyboard?" While @BanterousGooner said: "Did you have a seizure while typing this or something?" Arsenal fan @MegatronAFC, who describes herself as an "Aaron Ramsey enthusiast", said: "I didn't know Welsh was a language lol [sic]." Many of the tweets have since been deleted and people rushed to support Mr Ramsey on the micro-blogging site, calling the negative posts "horrible". Andrea Williams, from Rhymney, Caerphilly county, using her twitter handle @tyclyd1972, posted: "Why put such horrible status don't be jealous cause we got a different language we r proud to talk Welsh [sic]." 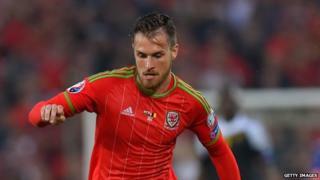 "Good to see people like @AaronRamsey tweeting in Welsh," Ffion Elena posted. "Can only be positive for our language." Mr Ramsey, who was raised in Caerphilly, attended Welsh-medium school Ysgol Gyfun Cwm Rhymni before signing with Cardiff City's youth academy. He played in Wales' crucial 1-0 home win against Belgium on Friday and has scored nine times during his 34 appearances for his country.